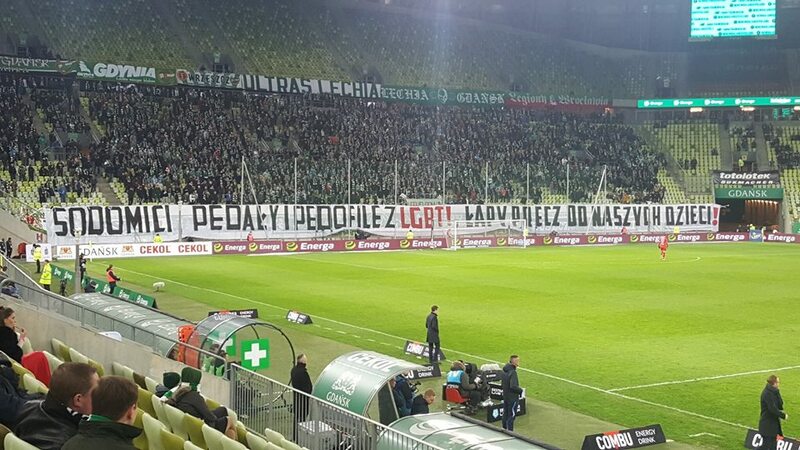 Following the first anti-LGBT banner unfurled at the Legia Warsaw match, at least six other soccer matches throughout Poland have had anti-LGBT banners displayed. While Legia Warsaw offered a shallow and unconvincing statement against the first one and despite several prominent Polish athletes speaking out against the homophobia. No action has been taken by the Polish Football Association nor any of the clubs to discourage the display of such virulently hateful banners. Pride in Football which is an alliance of LGBTQI Football Fans in the UK and Three Lions Pride which is an LGBTQI English fans group have written a letter to Union of European Football Associations (UEFA) to take action against the Polish Football Association. “We are deeply concerned at the apparent lack of action from the Polish FA in response to recent anti-LGBT and homophobic fan banners at clubs in Poland,” the letter read. So far, no action has been taken by the UEFA, Polish Football Association or any of the Polish Football Teams to discourage the display of these banners. The right wing Polish government has been brutally homophobic and anti-LGBT. Poland currently ranks 38th out of 49 European Countries in terms of LGBT rights and protections Poland offers very little if any protection for LGBT citizens and the conservative government has been openly hostile toward the LGBT community. In addition, anti-LGBT violence is quite high, with 70% of people who identify as LGBT having experienced violence motivated by anti-LGBT hate.